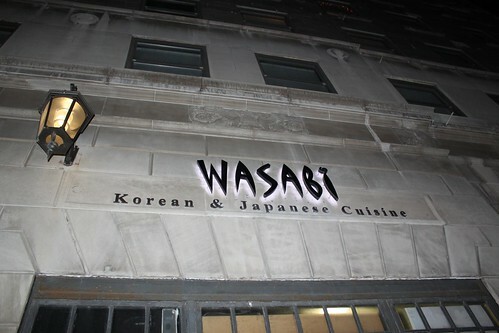 Wasabi is located on Kirby just east of the DIA in Detroit. The word “Wasabi” automatically makes you think of sushi, and Japanese food. Add Korean dishes to that and you have a restaurant I definitely want to eat at. Asian food is very mysterious to me. Sushi is the most straight forward in my book. So, anytime I get a chance, I like to eat something Asian I have not before. What made it even better was the coupon I found. More food for less money. Can’t beat that. We started with some appetizers. 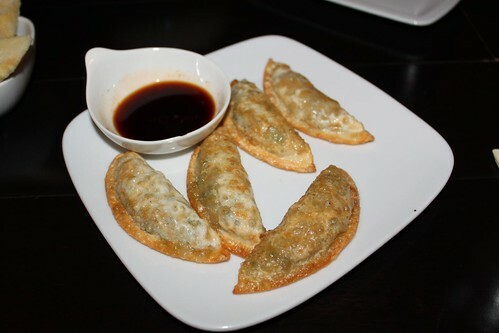 Shrimp Goyoza Shrimp dumplings, deep fried ($4.99). As anyone will tell you, I’m a sucker for fried dumplings. Crunchy and hot, just the way I like them. 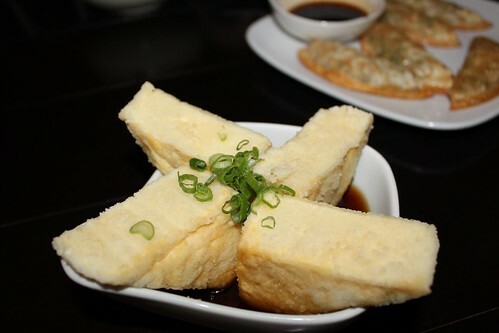 Agedashi Deep-fried tofu in tempura sauce ($4.99). Sam was not fond of these. I believe men do not like mushy textured food. I liked it. Firm on the outside, creamy middle and salty finish from the sauce. 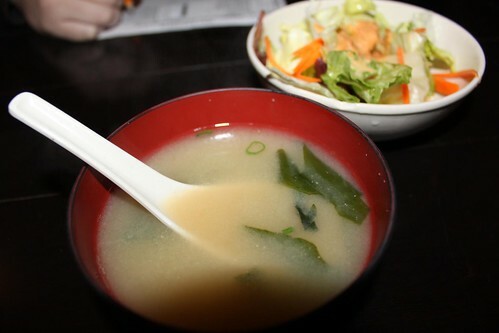 The ubiquitous Miso soup, and ginger salad. Nothing revolutionary. Taste was ok. I have had way better miso and salad. I can’t remember the name of the dish I had, but it was a Korean soup. 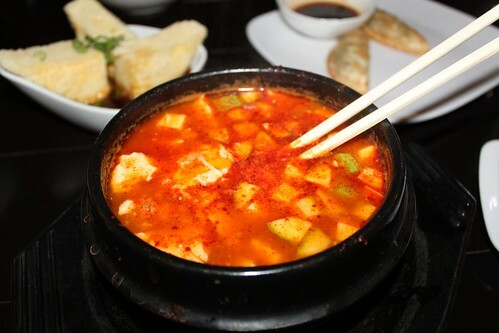 It had zucchini, tofu, and egg among other things in a great spicy broth. It was pretty good and my mouth was on fire just the way I like. I could have done with the veggies being cooked a little longer. 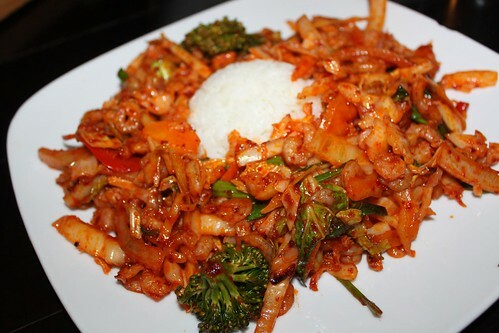 Sam had the Hot and Spicy Shrimp from the Korean menu- Shrimp, and vegetables in a hot and spicy sauce ($14.99). He loved it. Spicy, smoky and all around comforting. The sushi coming out to the tables looked fantastic with a great display of knife skills. 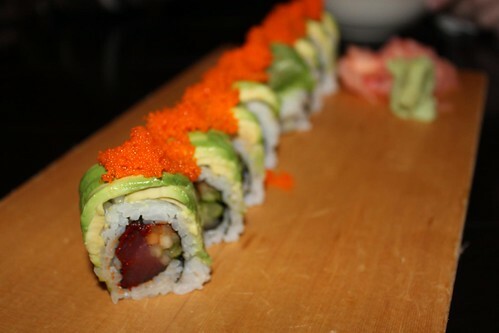 I had the Caterpillar Roll – Spicy Tuna wrapped with sliced of Avocado and Masago on top. It was really good. Not as spicy as I usually like, but still very good. 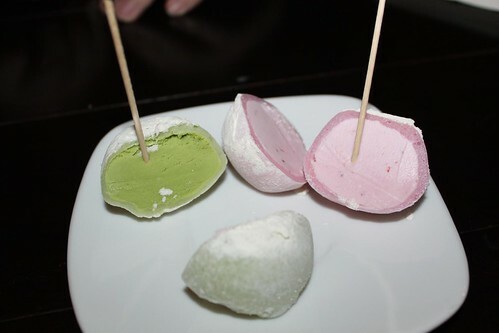 For dessert, we were pretty stuffed and just had these ice cream balls. It was green tea and strawberry. They are wrapped in a rice paste of sorts that is chewy and good. These were fun to eat. The strawberry was the best and sells out fast. The restaurant itself is cozy and small with a modernesque look with aluminum touches. We had no issues with the service or waitress. Although, I do have to mention, I have been there again recently and the owner or manager made the dining situation uncomfortable with him yelling at the waitress and the sushi chefs. You could tell everyone was on edge with him there. I would still recommend this place. Food is great, with a large selection. They also have Bibimbab’s, which is always a “hell yeah”. Have you eaten here, or do you have a Korean or Japanese restaurant in the area you would recommend? ++Mira++ posted this article under restaurant reviews, reviews	on Friday, December 23rd, 2011 at 2:00 am	You can follow any responses to this entry through the RSS 2.0 feed. You can leave a comment or trackback from your own site. View Technorati Linkbacks.